Vedema, a Luxury Collection Resort brings an unrivaled level of luxury and style to one of the world's most beautiful islands. Sleek and spectacular, with unprecedented privacy, Vedema inspires extraordinary journeys for the soul. Spacious, radiant guest rooms are filled with natural Mediterranean sunlight and feature garden or vineyard views. Each suite features a separate living space, marble floors, flat screen TVs and a private terrace or patio. Bask in the glowing island sun on the resort's private black-sand beach, or rest and recharge in the sparkling pool amid natural gardens. 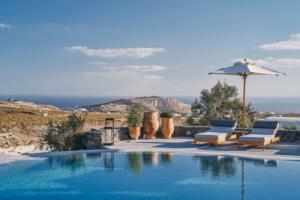 Located just 4 miles from the Santorini National Airport. Alati Restaurant, Canava Wine-Bar, Pergola, Black Rose. Santorini Ancient Thira, Akrotiri Excavations, Santorini Volcano Show, Fira Town, Vlihada, Kammeni Volcano.